I am talking about a ONE thousand pound piece of wood with a Haitian Flag, that is what Kita Nato is.. but it is more than just a piece of wood... it is a... symbol... a new idea for Haitian Unity... Haitians from all walks of life who don't know each other, getting together to carry a heavy load across the land. Kita Nago has been making it's way from across Haiti since January 1st 2013, and for the past 14 days, on foot, Haitian men and woman has carried this load from the southern peninsula, through Jeremie, on foot to Les Cayes, Aquin, Miragoane, Grand-Goave, Petit-Goave, Leogane, into Port-au-Prince. I read on Twitter that Kita Nago will rest along side Neg Mawon in Port-au-Prince for 24 hours before continuing it's journey to Ouanaminthe. The day Kita Nato reaches it's destination in Ouanaminthe each Haitian is to plant a tree. Once in the blue moon, an individual emerges with an idea that bigger than life. This is one of them. and I really hope it fulfills it intended purpose. « 12 Janvier 2013, 3rd anniversary of the Haiti earthquake, How do you feel? This is so amazing to see all Haitain peopple gather around the country carrying the Unity of pride. 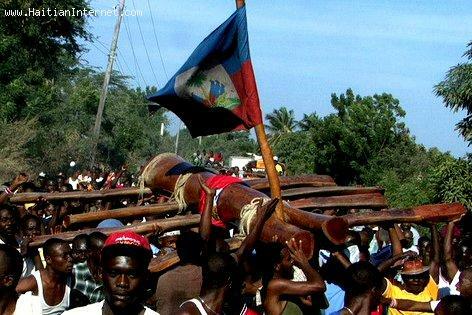 This is so amazing to see all Haitian peopple gather around the country carrying the Unity of pride. Harry Nicolas, Je vous felicite pour cette idea. pour moi vous etes un Toussaint Louverture un autre Jean-Jacques Dessalines et je souhaite que vous inspirez a d'autres Haitiens de suivre votre example, que ce soit en Haiti ou un Diaspora en exil. Congratulation for that idea. You are one of our past Heroes. I would like to say thank you to Mr. Nicholas for initiating this project. This project shows that nothing is impossible and whatever we "Haitian" our minds into it can be done. Mr. Nicholas has shown to the world and to the Haitian people that we can overcome what we "Haitian" people going through. He is teaching young men and women that we are stronger than they have described us. Our nation and culture is much more than what the naysayers are saying about Haitian people. Se sa ki men anpil chay pa Lou. In only 14 days, Haitians from les Irois to PAP made it possible to make this half ton piece of "acajou". Si nous vle peyi a vanse nous ka Fel vit et bien. This is a great symbolism on how this population can make it happens. I think individually we have to retrospect and see how we can help the country without the help of foreigners.